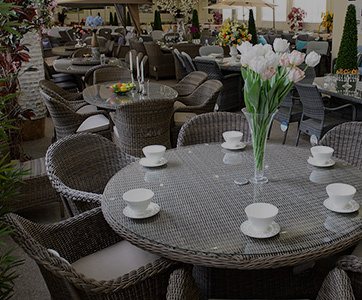 Imagine not having to worry about bringing your garden furniture cushions in every time you use them. 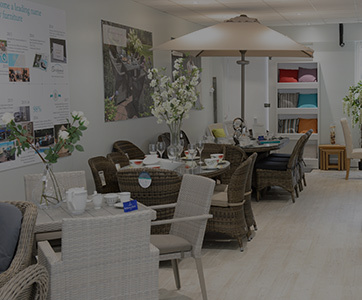 Effortlessly providing the luxury of no longer having to worry about stains, spillages or sudden changes in the weather, our exclusive range of fully waterproof cushions are perfect for erratic English summers and for second homes in warmer climes. Socialising in the sun can be as carefree as it is meant to be with peace of mind that spilt drinks and unexpected downpours won’t be a problem. 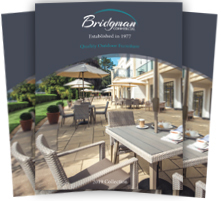 Call us today on 020 8804 7474 to find out why Bridgman waterproof cushions are unrivalled in comfort and quality. 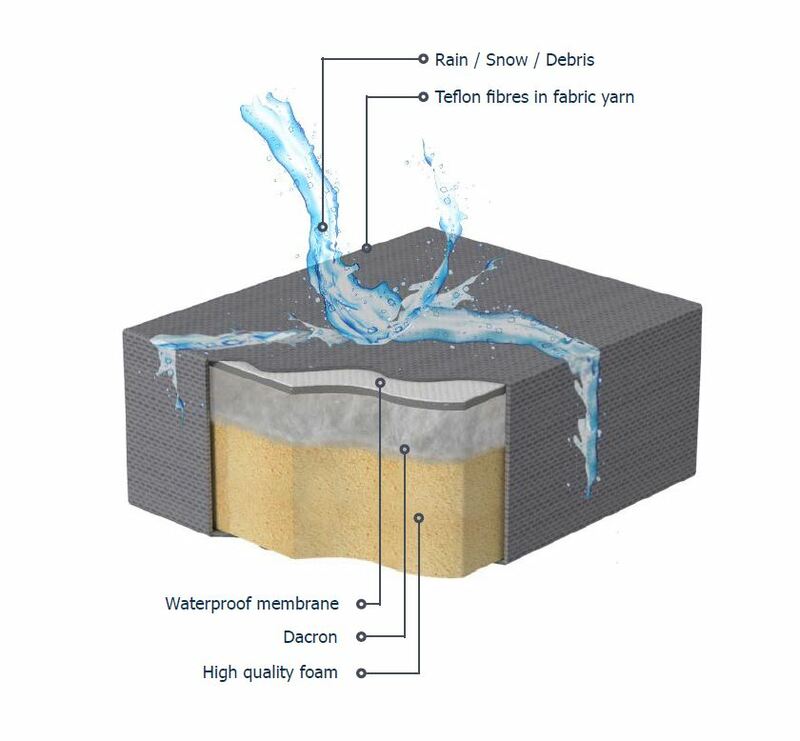 We spent 6 years developing and refining an exclusive range of waterproof cushions that can remain outside throughout all weathers. 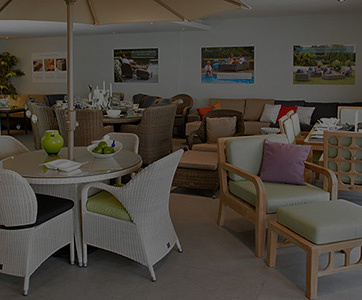 Waterproof cushions are exclusive to Bridgman and are made to specifically fit Bridgman garden furniture. 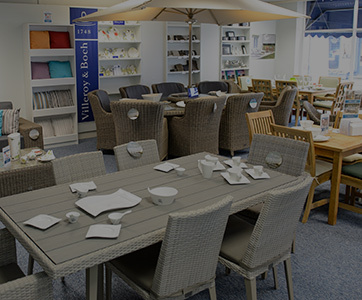 The marine grade Acrylic fabric used on the cushions is completely waterproofed with a special membrane that will not let water through the outer fabric. 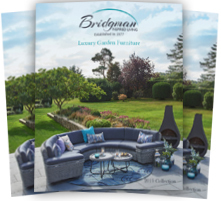 This allows us to use soft foam that you sink into, making Bridgman furniture the most comfortable available. Simple to clean, all it requires is mild soapy water and a soft brush to lift away surface dirt and keep it looking as good as new. It is also Teflon treated, making it almost impossible to stain – we’ve tested it with red wine, coffee and even pure bleach. In order for the cushions to breathe, the cushions are vented, so a small amount of moisture will be absorbed inside the covers. In normal conditions this will quickly dry out and will not be noticed. Lifting or turning cushions to allow circulation of air is recommended after extended periods of rain. In the unlikely event that the fillings become saturated the covers can be removed, to allow the fillings to fully dry. To prolong their life we recommend you store them when not in use – particularly over the Autumn and Winter. We strongly advise all customers to read the small print when buying ‘showerproof cushions’ from other retailers. 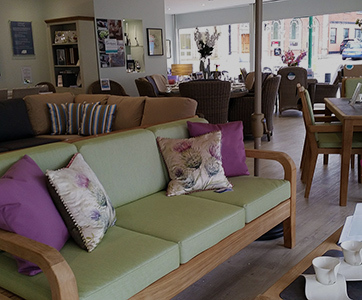 If you would like a quotation for bespoke waterproof cushions, please fill out the below form with as many details as possible and we will get back to you with a quotation and timeframe. 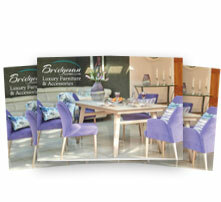 Lead times are typically 6-8 weeks for all bespoke cushion orders.